As per team tradition, the Packers select game captains each week. Today’s captains will be T/G Don Barclay (offense), LB A.J. Hawk (defense) and S Sean Richardson (special teams). Packers S Sean Richardson is just happy to be wearing a uniform after all he’s been through in the past year to come back from neck surgery. But he may be more than just a contributor down the stretch this season. He could be moving into the No. 2 safety spot. Richardson took the bulk of the snaps in last Sunday’s game alongside Morgan Burnett after M.D. Jennings missed an open-field tackle on Atlanta WR Drew Davis’ 36-yard TD catch. Asked on Wednesday if he expects to start on Sunday in Dallas, Richardson said he didn’t know. Calling it “a long journey” to come back from his neck fusion surgery, Richardson — who missed all of the offseason and training camp and began the regular season on the PUP list — said even with limited on-field time in his second season, he still feels like a much better player than he did last year as an undrafted rookie. Now, should he indeed seize a larger role on defense the rest of the way, Richardson has to take advantage of it. His window of opportunity to play this season seemed small given the type of injury he was recovering from, but now here he is. He’ll be one of the more intriguing players to watch as the season winds down. The Packers coaching staff has awarded game balls to four players for their performances in the 22-21 victory over Atlanta on Sunday at Lambeau Field. 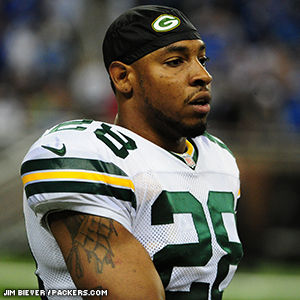 TE Andrew Quarless was honored on offense as he posted career highs with six receptions for 66 yards. Quarless also caught a 2-yard TD pass in the fourth quarter — his first touchdown since his rookie season of 2010 — that provided the winning points. On defense, DE Johnny Jolly and CB Jarrett Bush were the recipients. Jolly was credited with a handful of tackles, including one for loss, plus a fumble recovery and a batted pass. Bush, who played the dime defensive back spot, made two huge plays down the stretch. He broke up a fourth-down pass to TE Tony Gonzalez with the Falcons on the edge of field-goal range with just under two minutes left, and then he intercepted QB Matt Ryan with four seconds left to seal the win. S Sean Richardson received the game ball on special teams. Richardson, who got his most extensive action of the season on defense, taking over at safety for M.D. Jennings, was credited with one coverage tackle, and he was part of a solid day for the return units, as CB Micah Hyde averaged 25.3 yards on three kickoff returns and added a 12-yard punt return. 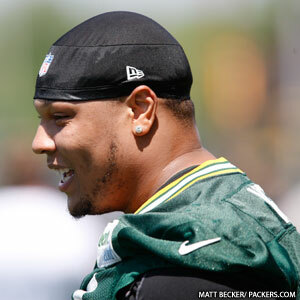 Packers DE Jerel Worthy and S Sean Richardson, who have been on the physically unable to perform (PUP) list since the start of training camp, practiced for the first time this season on Wednesday. For both players, returning to practice starts a three-week window during which they can practice without counting against the 53-man roster. After three weeks, they will have to be put on the active roster, declared out for the season or released. 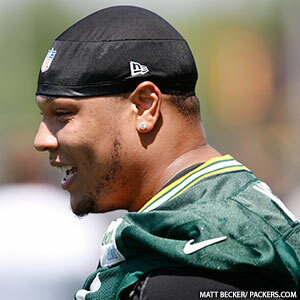 Worthy, a second-round draft pick in 2012, injured his knee in Week 17 at Minnesota last season. McCarthy joked that he knew Worthy, who was practicing on the scout team, was back because he jumped offside a couple of times. Worthy always tries to get a jump on the snap count and was too early several times as a rookie. Richardson, an undrafted rookie last year, injured his neck in Week 12 last season in the road game against the Giants and needed spinal fusion surgery to repair it. There was concern he might not get medical clearance to play again, but he’s grateful for whatever opportunity he may have to help the Packers by season’s end. Two of last year’s rookies who ended the season on injured reserve, DE Jerel Worthy and S Sean Richardson, both plan to be back in 2013 but there is no timetable on either player. Worthy (pictured) is likely to be out the longest, having injured his knee in the final regular-season game at Minnesota last season. Though it’s possible Worthy could miss his entire second season if his recovery takes a full 12 months, he vowed to be back sometime in 2013. Richardson, meanwhile, is aiming to be back for training camp in late July but wasn’t making any promises. He is coming back from surgery to repair a herniated disc in his neck. After making the roster as an undrafted rookie last year, Richardson first missed time with a hamstring injury, then played in five games (mostly on special teams) before beginning to have back problems. That led to the discovery of the neck issue, which required surgery. It was performed by the same doctor who fixed Denver QB Peyton Manning’s neck, he said. The surgery wasn’t as complicated as initially thought, Richardson added, so his recovery has been fairly smooth. Without getting into specifics, he said the medical staff has given him five hurdles he must clear to get back on the field, and he’s currently working on step four. He hopes to clear the final two hurdles in time for training camp, so he can begin competing with Jerron McMillian and M.D. Jennings for the starting safety spot opposite Morgan Burnett.